Home/Editorial Cartoon, Gag Cartoon, Political Cartoon/In or Out? In or Out? The Prime Minister calls it perhaps the most important decision of our time. Most people are worried about what could go wrong. Some people couldn’t care less. 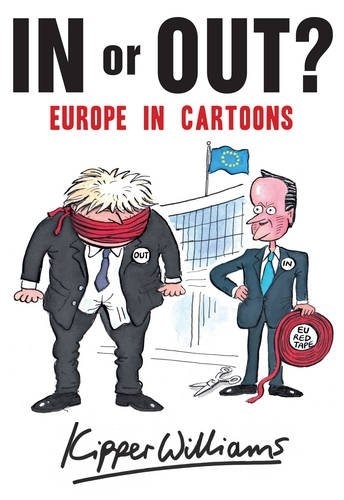 But this summer, the debate on Europe is the centre of national conversation: From Brussels’ red tape to tax dodging corporations, from batty nationalists to Machiavellian Europhiles, from Dave and Boris to Mrs Merkel and Her Majesty, from triumph to farce – and back. Kipper Williams finds all the ingredients for comedy in the great Euro debate. Kipper Williams is a cartoonist for ‘The Spectator’ , the ‘Guardian’, ‘The Sunday Times’, ‘Private Eye’, and ‘Country Life’, among others. He has provided illustrations for a number of books, including Bill Bryson’s ‘A Short History of Nearly Everything’. He studied Fine Art at Leeds University and has since been exhibited and acquired by British Museum and Victoria and Albert Museum. He is the winner of the Duval Foundation Award (2010) and the Joke Cartoonist Award (2013). He lives and works in Central London.